MKV is an increasingly popular video format, mainly because of its open source roots, and it being increasingly used for H.264 encoding. The problem is that many standalone devices simply do not support the MKV format, often preferring the MP4 container format for use with H.264/MPEG-4 AVC encoding. This guide shows you how to play MKV files on the Xbox 360, which supports H.264/MPEG-4 AVC, but does not support the MKV container. While the instructions in this guide can also be used to get MKV files to play on the PS3, we've left that to a different guide using different software that's more suited to the task. And as with most guides on Digital Digest, we will only use freeware unless there's no alternative. This guide uses freeware software titles only, namely GOTSent. GOTSent is an application designed specifically for the task of converting MKV files to MP4 so they play on the Xbox 360 (and the PS3). GOTSent can also convert WMV files to MP4. MKV is just a container format. Meaning, like AVI files, what's "inside" it could be anything. In other words, an MKV is just as likely to contain a video stream encoded via XviD as it is to contain a H.264/MPEG-4 AVC stream. The majority of MKV files do use H.264/AVC, so this guide will concentrate on these kind of files. If you know for a fact that your MKV file does not use H.264/AVC, then you can skip straight to step 2. The easiest way to see what kind of streams the MKV file is made up of is to use MediaInfo. Download the 32-bit or 64-bit version of MediaInfo and follow the steps in the installer to install the software. Once installed, locate the MKV file you wish to play on your Xbox 360, and right click on the file and select the "MediaInfo" option. This will start MediaInfo and it will display information about the MKV file. I've highlighted the important pieces of information in the screenshot above. First, "AVC" identifies the video stream as H.264/AVC. So far so good. The "High@4.1" indicates that the H.264 High Profile was used with Level 4.1 decoding. This is excellent, as the Xbox 360 supports High Profile up to level 4.1. Any higher (for example 4.2, or 5.1), and the Xbox 360 might struggle to play the file or play it with a blank screen. Any lower is no problem at all. The third piece of information is the number of audio channels. The Xbox 360 will only support 2 channel audio, so anything higher will automatically be downmixed by GOTSent to 2 channels, so be aware of this limitation before proceeding. If your MKV file used a H.264 stream with higher than level 4.1 encoding, then GOTSent may need to transcode the file back down to level 4.1. This means video encoding in the H.264 format and this could take some time, up to several hours for a typical movie. If on the other hand the stream is already Xbox 360 compatible, then it's only a simply matter of "repackaging" the MKV file to a MP4 file, which takes a matter of seconds. If your file wasn't H.264, then don't worry about it, GOTSent can convert your file to the required format, although again this means you need to put aside some time for the encoding process. Before we install GOTSent, the software requires AC3Filter and Haali Media Splitter to be installed in order to work. If you have a codec pack like K-Lite, CCCP, or Vista/Windows 7 Codec Pack, you may already have one or both installed. Once extracted, you should have a few files and a bunch of directories. 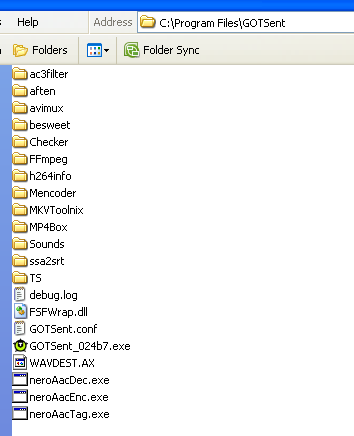 The GOTSent documentations also recommend that you download and extract the Nero AAC executables into the same folder as GOTSent, so your GOTSent folder should look something like in the screenshot below. To start GOTSent, simply locate and run the GOTSent executable inside the folder. If you're using Windows Vista or Windows 7, you need to run the GOTSent in Administrator mode by right clicking on the executable and selecting "Run as administrator".